Some northern and southwestern Ontario producers who had to sell breeding livestock due to drought in the 2018 tax year can now defer chunks of the income from those sales when filing their income taxes. 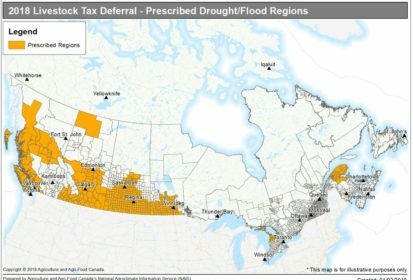 The federal government on Wednesday rolled out its final list and map of designated regions for 2018 under its livestock tax deferral provision, to include 14 census subdivisions in Ontario for the third year in a row. More jurisdictions in Saskatchewan, Manitoba and Alberta were also added. The initial list, released Sept. 14, included multiple regions in British Columbia, Alberta, Saskatchewan, Manitoba, and Quebec. Other areas of those provinces, plus parts of northern New Brunswick, were added Oct. 31. Low moisture levels resulted in “significant” forage shortages for livestock producers in the affected areas in 2018, the government said in a release Wednesday. The cost of replacing the animals in 2019 will offset the deferred income, reducing the tax burden associated with the original sale, the government said. Producers in designated regions can request the tax deferral when filing their 2018 income tax returns. To defer income, a breeding herd must have been reduced by at least 15 per cent. If it’s reduced by less than 30 per cent, 30 per cent of income from net sales can be deferred; if it’s reduced by 30 per cent or more, 90 per cent of income from net sales can be deferred. Where jurisdictions are designated over consecutive years, producers can defer sales income to the first year in which the region is no longer prescribed, the government said.